During two weeks between the third and fourth quarters of the academic year, Notre Dame introduced NDXL, an experiential learning opportunity for our students. The goal of NDXL is to immerse students in learning laboratories where they can develop new skills, discover new talents, and explore new passions. With guidance from their lead and supporting teachers, students engage in individual and group reflection on their experience. Research indicates that experiential learning is an excellent tool for the development of teamwork and collaboration, leadership, self-initiative and direction, and civic literacy and citizenship. The twenty-nine course offerings included half- and full-day courses, a service trip to Philadelphia, learning excursions to Spain and Grand Canyon, and internships. 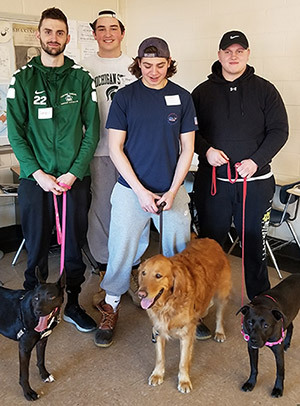 Here are some comments from students who participated in Pet Therapy, March Mathness, Bioscience Internship, and Fire and Rescue Internship at the West Haven Fire Department. Course Description: Partner with the Animal Assisted Therapy Service (AATS) Program for hands-on work with their therapy dogs to learn to manage them, bond with them, and explore the many possible ways the dogs help a variety of individuals. An excursion to a local assisted living/rehab facility will provide the students with first-hand experiences of the service animals at work. Participants will read literature on the purpose, benefits, and procedures for pet therapy and obtain a Certificate for Pet Sitting and Dog Walking. "I chose the Pet Therapy course because I am intrigued by how animals can help humans and provide therapy. Learning how to train an animal to be a therapy animal will give me an opportunity to go out into the community and help others in need and spread awareness of the important role a therapy animal plays in society. NDXL challenged my classmates and me to adapt to something new to us while working together as a team. We had to learn the commands, get the animals to adapt to our lead, and, then, get them to respond." On the last day of the program, the students tested their newly acquired skills through a visit to RegalCare of West Haven. Course Description: Students will collect data and complete analyses of individual games that are being played in the Men's Division I Basketball Tournament. They will track player data across games and predict outcomes of games. Students will also study different offensive and defensive strategies and practice them in a game-like setting. 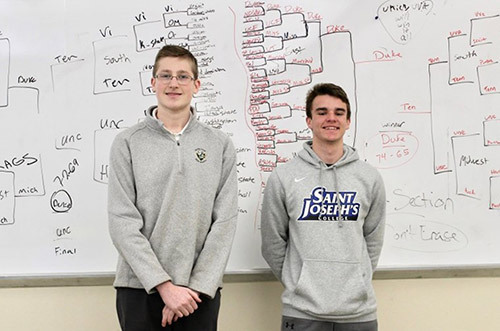 Clayton and Michael were attracted to March Mathness because of their interest in Basketball and the NCAA Tournament. Delaney: "I was curious to see how my picks would match up against the statistics that I was analyzing." Bobko: "I didn't expect the math aspect of the class to be as interesting as it turned out to be. That's because it tied into my love of basketball. Also, it was cool and interesting to learn how statistics can actually have real-world application in the workplace." "At Assembly Biosciences in Groton, I worked with bacteria found in the GI tract. I was assigned to a team that conducts experiments to grow the bacteria quickly. The goal is to develop medicine to treat inflammatory bowel disease and Crohn's disease. We work in an anaerobic (oxygen-free) environment because the bacteria will die if exposed to too much oxygen. I plan to major in science when I got to college next year. In my NDXL internship, I'm learning how a lab functions and I'm also getting insights into the potential applications of my planned major in cellular and molecular biology. 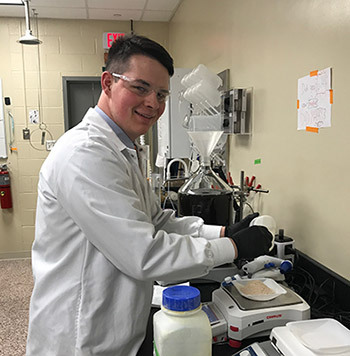 This internship is helping me figure out what I may do in the future, not to mention helping me get ahead when it comes to procedures that are consistent throughout all labs." 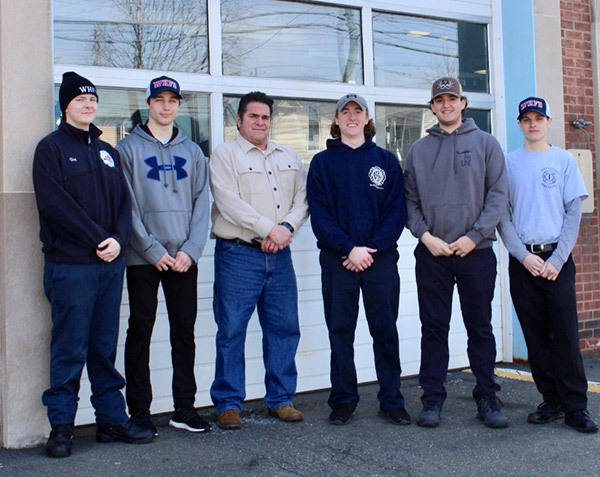 Course Description: Experience Firefighting and Emergency Services in day-to-day operations mode with West Haven Fire Department. This internship includes ride-alongs, fire prevention, protection and investigation, and 911 fire dispatch. The five interns are all interested in careers in firefighting and emergency services. The three ND juniors are already serving as volunteers in West Haven, North Branford, and Woodbridge. "One of the greatest things each of us has taken away from this internship is the importance of sacrifice and service that all firefighters and first responders dedicate their lives to. Every man and woman in this profession gives so much, but nothing compares to the rewarding feeling you get every day knowing those in need are getting the care they deserve. Every first responder has a personal relationship with the community he or she swears to protect and serve. Of course, nothing is more tightknit than the Fire and EMS family we've come to know here at the WHFD. Whether we are cooking a meal, training, or responding to a call, there is a strong sense of brotherhood. No matter what, we all have each other's back." Character to Lead -- Compassion to Serve -- Confidence to Excel.